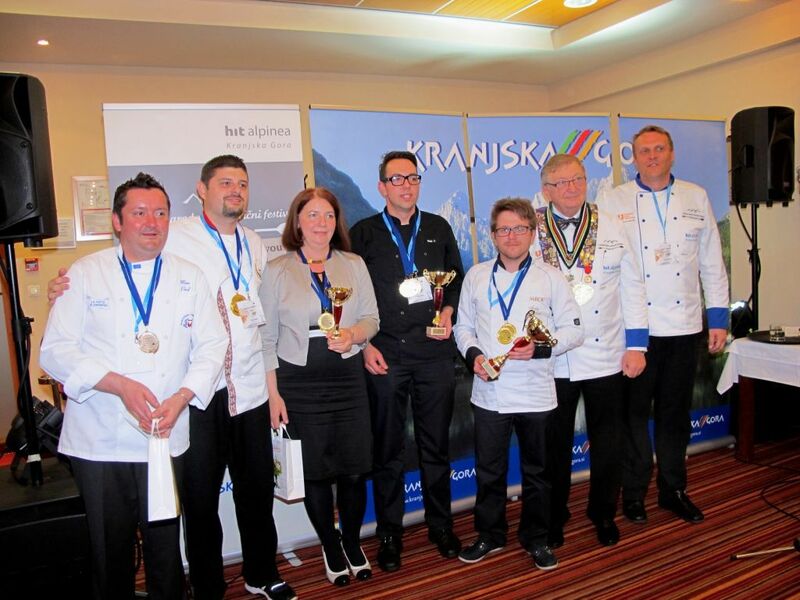 The hotels of the Hit Alpinea Company in Kranjska Gora contributed to the diversification of the destination’s tourist rhythm with the first International Culinary Festival. In addition to the competitive part of the event, visitors’ interest was attracted by the joint presentation of local caterers and craftsmen, whereas eno-gastronomic enthusiasts were enticed by the superior dinner bearing the signature of three top chefs. 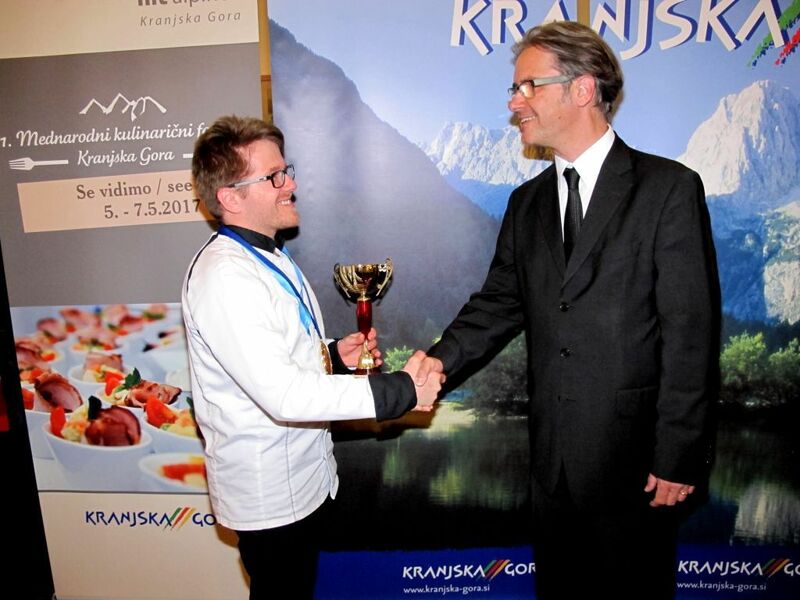 The professional jury of the festival decided that Štefan Sraka from Renkovci, Slovenia proved to be the best among forty chefs from six countries. The organisers have already predicted that the second festival will take place in May 2017. Forty competitors of both genders from six countries, i.e. from Italy, Turkey, Serbia, Croatia, Macedonia and Slovenia, competed for two days in four categories. The international jury was presided over by acknowledged international culinary judge Iztok Legat. The chefs’ creations were evaluated by ten judges, including Gary Filby, international judge and establisher of the English Association of Chefs, and Alma Rekić, known for her role as a judge in the Masterchef show. On Friday evening, 6 May 2016, a special gastronomic adventure took place at Ramada Hotel & Suites, as its kitchen was taken over by three top chefs from three countries: Hrvoje Zirojević (Croatia), Marc Pavel (Italy) and Alma Rekić (Slovenia), who produced three incredible culinary creations (the menu is in the attachment). The dinner, which was sold out more than a week before the start of the events, hosted 50 guests, including a group of Croatian and Italian journalists, whereas some of the others came to Kranjska Gora from all parts of Slovenia for this particular opportunity. Fedja Pobegajlo, chief executive of the Hit Alpinea Company, says: “Following the example of the Culinary Journey in Kranjska Gora, we organised this event in order to connect the destination and prepare new offers and activities for our guests. The competitive part was just one of the segments of the event. In addition to competitions, the programme offered guided tours of Kranjska Gora and its surroundings with a special tourist bus. At the Ramada Resort stands, visitors were able to discover and buy interesting products from local craftsmen. A special culinary workshop was intended for children on Saturday, and visitors had the opportunity to dine at five different locations, offering catering services, during the pleasant walk on the Saturday Culinary Journey in Kranjska Gora. The festival offered a challenge for young talented chefs. In the A1 and A2 Categories, chefs under the age of 23 competed by preparing two dishes. Among eight young competitors, Gregor Potočnik was the winner of the JUNIOR category, while Matej Zupančič took second place and Timotej Rožič finished third. The winner and the runner-up are both students at the Secondary School for Catering and Tourism in Ljubljana. The joint winner of the festival was Štefan Sraka, the silver medal was won by Jernej Rac, third place was taken by Mirjana Miljević, fourth was Nebojša Veselinović from Serbia and Pavel Marc from Italy finished fifth. The best cake was prepared by Milana Jovanovič, and the cup for creative courgettes called Guns N’ Roses was awarded to Nenad Mladenovič. The winner, Štefan Sraka from Renkovci, said at the awards ceremony: “I did not specifically prepare for this competition, which is why I am even more pleased with the success. In the final, I prepared a warm appetizer from freshwater and sea delicacies and demonstrated the knowledge I gain from everyday experience in the kitchen. For me, this is undoubtedly the occupation that I enjoy working at and can constantly improve myself.” The participants, including the professional part of the team and competitors, as well as numerous visitors were astounded and delighted with the first performance of the festival and the competition. “The major advantage of festival activities can be seen in connecting contents from various tourist providers. The event truly united Kranjska Gora, and as a destination it offered its guests everything they are most interested in during their stay there – everything special that draws them here. Good co-operation and positive responses from the festival have led us to the decision to transform it into a traditional event. Negotiations on the next top culinary evening are already in progress,” said Fedja Pobegajlo at the closing of the festival.